Man of Steel spoilers! Kinda! 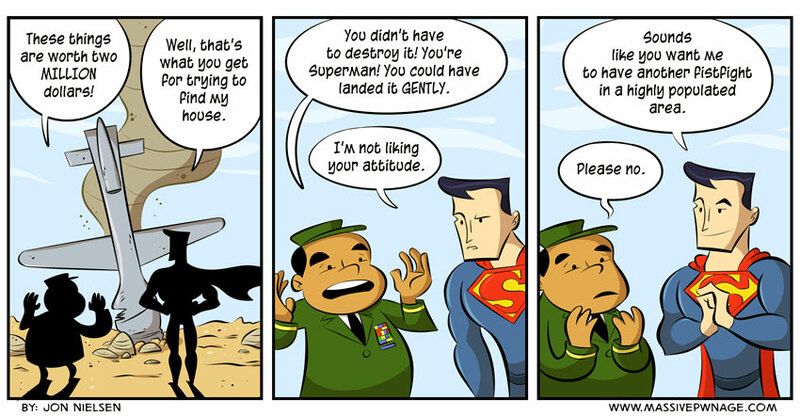 Superman actually does this and it’s pretty not cool! What’s up with THAT? This entry was posted on Friday, July 5th, 2013 at 12:00 am and is filed under Comics. You can follow any responses to this entry through the RSS 2.0 feed. Both comments and pings are currently closed. Well, but he didn’t choose to have 90% of all superpowers. The government, on the other hand, has the option of whether or not to monitor every . . . single, um . . . this very . . . huh. Of course, this very compliant, law-abiding citizen acknowledges the occasional necessity of temporarily curtailing a minor freedom in order to maintain the others which we, the people, hold so very dear.